Tenant Victor wants to have a service dog in his apartment. You are the resident manager of a mid-sized apartment complex of 50 units. Your property management company has a “no pet policy” in the apartment complex. Victor appears to be the model of good health. You get a letter that Victor claims to have a disability that requires the need of a service pet. Victor claims that the nature of disability is confidential. After speaking to Victor on the phone, he tells you that he desires to have a comfort animal in his apartment to calm his nerves, and the proposed pet is named “Vera.” His proposed comfort animal, Vera, is a small German Sheppard with no history of dog biting and no history of loud barking. Victor has taken the dog to obedience school and has made an effort to get the dog certified as a service animal to help him calm his frazzled nerves. Can you request information and records about Victor’s claimed disability? If a disability is not obvious, what kinds of information may a housing provider request from the person with a disability in support of a requested accommodation? Depending on the individual’s circumstances, information verifying that the person meets the Act’s definition of disability can usually be provided by the individual himself or herself (e.g., proof that an individual under 65 years of age receives Supplemental Security Income or Social Security Disability Insurance benefits or a credible statement by the individual). A doctor or other medical professional, a peer support group, a non-medical service agency, or a reliable third party who is in a position to know about the individual’s disability may also provide verification of a disability. In most cases, an individual’s medical records or detailed information about the nature of a person’s disability is not necessary for this inquiry. Once a housing provider has established that a person meets the Act’s definition of disability, the provider’s request for documentation should seek only the information that is necessary to evaluate if the reasonable accommodation is needed because of a disability. Such information must be kept confidential and must not be shared with other persons unless they need the information to make or assess a decision to grant or deny a reasonable accommodation request or unless disclosure is required by law (e.g., a court-issued subpoena requiring disclosure or a lawsuit is filed that puts the nature of the disability at issue.). So, as a property management company and landlord, specific disability information should be kept confidential from other residents and should be kept “under seal,” or labeled “confidential” so to speak, in the property management office. Use good professional judgment in keeping the file sealed and confidential. In Victor’s case, it is important to obtain some basic information about the specific nature of the disability – this may be in the form of a doctor’s letter. If you don’t know anything or understand about the nature of the disability then you cannot assist and accommodate the tenant to be in compliance with the law. Some disabilities may be obvious- others are not. A mental, psychological, or emotional disability condition may be the hardest to notice or fully understand without a medical opinion. The tenant may not want to discuss the condition unless he or she must do so. You should maintain limited confidentiality of the medical information if the tenants requests that you do so. Also, if the tenant does not provide any documentation, the tenant may be claiming a disability fraudulently, just to get around a “no pet policy.” The claim of a bogus disability is more common than you think, as some tenants may take liberties to get special privileges at the apartment complex. Can you request information about Vera’s demeanor as a service pet? It is a smart idea to do some investigation and ask the tenant to verify in writing whether the dog has any history of biting, snapping, or loud barking as to cause a nuisance to other tenants. Has the dog itself been a victim of abuse? Has the pet had multiple owners or was ever abandoned? Ask the tenant if there were any issues with the dog at their prior residence, which may have been the city dog pound. Has the dog been formally trained? If a dog is properly trained and certified as a service dog, usually the dog is well behaved. Don’t judge the dog based on the fact it is cute or adorable. But you don’t get to know the dog’s personality until the dog stays at the property. You will learn a great deal about the personality of the dog after 30 days. You should see and meet the pet to get an idea of the pet’s personality. 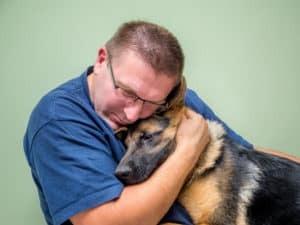 If a doctor has diagnosed Victor with a mental disability or handicap, can you enforce the no pet policy to stop Victor from housing Vera the doggy as a service animal or comfort animal? No, you are required by law to allow the pet if the pet is not a knowingly dangerous or a nuisance to other residents. Monitor the situation; you won’t know the pet’s personality until the pet has been tested in its new environment. If you can verify Victor’s disability condition with some reasonable certainty, and don’t allow Victor to house Vera as a service dog, what can Victor do? Victor’s rights and remedies under California state law include, a person discriminated against on the grounds of disability pursuant to Cal Civil Code section 54.1 can ask the local district attorney, city attorney, the Department of Rehabilitation acting through the Attorney General, or the Attorney General to bring an action to enjoin the violation, civil penalties, damages, or to seek other remedies, or he or she may bring his own private legal action. (Cal. Civ. Code 55 and 55.1.). The prevailing party in the action shall be entitled to recover reasonable attorney’s fees. Under the dual federal law track, Victor may either file a lawsuit or may file a complaint with U.S. Department of Housing and Urban Development (HUD), not later than one year after the discriminatory act has occurred and HUD may pursue legal remedies on his behalf. (42 U.S.C. Section 3610 and 3612.) Vera may also pursue an action through the Civil Rights division of the U.S. Department of Justice as a referral from HUD to file a complaint on behalf of the United States in federal court. 42 U.S. Code 3612 (p) provides attorney’s fees and costs for the prevailing party for a discrimination complaint filed with HUD, an administrative law judge, or federal court. Just a word of comfort – even if you get sued by the government for a disability discrimination claim, the claim can be settled if the government is reasonable. Most governmental offices want to settle cases with written settlement agreements, and not a lot of protracted litigation. The government does not have unlimited resources, and may want your company to implement a better management policy with respect to tenants who claim disabilities. However keep in mind, that plaintiffs can seek damages, penalties, and attorney’s fees and costs. Should you charge Victor a pet fee for hosting Vera? No. Landlords may not require applicants or residents to pay a pet deposit for a service dog, psychiatric service dog, or support animal, even if they do so for other applicants or residents. This is based on the policy statement contained in the Joint Statement of the Department of Housing and Urban Development and the Department of Justice Reasonable Accommodations under the Fair Housing Act. This is a strange rule because a service or comfort animal can destroy an apartment as much as a regular pet that is housed by a non-disabled tenant. Shouldn’t the landlord be protected if the tenant moves out and the apartment has major damage from the pet? The law and authorities tend to view the pet fee as a discriminatory penalty. If your real estate company approves Vera as a comfort or support animal, and Vera starts snapping or biting other residents in the complex or barking loud in the complex, what can you do? Although you are making every effort to reasonably accommodate Victor with his pet request, Victor is not the only person that you should be concerned with at the apartment complex. Other residents have rights of quiet enjoyment under their rental agreements. If the Veras of the world are being a “nuisance,” and posing a risk of harm to others, you should speak to the tenant about the issue, and you should follow up and send the tenant a letter requesting to get control of the dog. The dog may need additional training or additional supervision. Have positive and friendly communication channels with the tenant that is not adversarial. If that does not work, and you have to put the hammer down, you can also send the tenant a three day notice to perform covenant or quit to request that the tenant control the animal. If the tenant does not get control of the dog, or the tenant is snapping or biting, then you can call animal control authorities to file a complaint. How can you prepare and train your employees and staff for these kinds of situations? The fact scenario presented about Victor and Vera is more common than you think. Now you have a flavor for the issues and state and federal disability laws. More and more tenants are trying to use the disability laws to obtain special accommodations. Some requests are legitimate and lawful, and others are manipulative and fraudulent. It is important to educate yourself on the issues so you are ready for this type of situation, and have a plan for dealing with it. If your real estate company or property management company in Southern California needs counsel and additional in office training and administrative and legal support on the laws and regulations of disability and fair housing, please contact LA Real Estate Law Group to schedule a training session in your office.